New York Rangers President and General Manager Glen Sather announced today that the club has agreed to terms with forward Christian Thomas. Thomas, 18, ranks first in the Ontario Hockey League (OHL) with 95 goals over the last two seasons, and eighth in scoring with 165 points over the span. He captured "Most Dangerous in Goal Area" and "Best Shot" honors in the 2010-11 Eastern Conference Coaches Poll and was voted runner-up in "Hardest Shot" after finishing second among all Canadian Hockey League (CHL) skaters with a career-high, 54 goals. He and his father, former NHL forward Steve Thomas, became the only father-son duo to record 50-plus goals in an OHL campaign. Christian Thomas, the first Rangers prospect to score 50 goals in an Ontario Hockey League regular season since Ryan Callahan, went on to lead the league in playoff scoring per-game average with a remarkable 19 points in only 10 postseason games. Thomas skated in 66 games with the Oshawa Generals (OHL) this season, registering 54 goals and 45 assists for 99 points, along with 38 penalty minutes and a plus-20 rating. He established career-highs in points, goals, assists, power play goals (19), game-winning goals (nine), penalty minutes, and plus/minus rating. Thomas ranked second in the OHL in goals and sixth in points, and tied for first in the league in power play goals and third in game-winning goals. He led Oshawa in goals, assists, points, power play goals, and game-winning goals, tied for second in shorthanded goals (two), and ranked third in plus/minus rating. Thomas posted a career-high, 28 multi-point performances, including four hat tricks. He tallied a career-high, four goals on February 11 at Sudbury, to begin a career best, eight-game scoring streak (10 goals, four assists over the span) and season-high, five-game goal streak (eight goals). In the 2011 OHL Playoffs, Thomas led the league in postseason scoring with 19 points and nine goals at the time of Oshawa’s elimination in the second round, having recorded at least one point in nine of 10 contests and six multi-point performances. He finished the playoffs tied for seventh in the league in points, ninth in goals, 14th in assists (10), sixth in power play goals (four), and 17th with a plus-eight rating despite only skating in 10 playoff contests. Thomas led the Generals in playoff goals, points, power play goals, and plus/minus rating, and ranked second on the team in assists. He tallied three assists while making his OHL playoff debut on March 24 vs. Kingston, and followed that up with a four-point effort (two goals, two assists) on March 25 at Kingston. The 5-9, 170-pounder has skated in 189 career OHL contests with the London Knights and Oshawa Generals, registering 103 goals and 87 assists for 190 points, along with 79 penalty minutes. In 2009-10, Thomas led Oshawa in goals (41), points (66), power play goals (16), and shorthanded goals (four), and ranked among the league leaders in several goal-scoring categories, including seventh in goals, and tying for second in shorthanded goals and sixth in power play goals. His 41 goals were the third-most among all players drafted in the 2010 NHL Entry Draft, behind seventh overall pick Jeff Skinner (Carolina) and second overall pick Tyler Seguin (Boston). His four shorthanded goals also established a new Oshawa franchise record. Originally selected 13th overall by London in the 2008 OHL Priority Selection, Thomas was a part of the blockbuster OHL trade on January 8, 2009, that sent him along with Scott Valentine (Anaheim), Michael Zador (Tampa Bay) and six draft picks to Oshawa, in exchange for Michael Del Zotto, John Tavares and Daryl Borden. Thomas made his OHL debut with London on September 17, 2008 at Saginaw, and registered his first career point with a goal on September 20, 2008 at Sarnia. 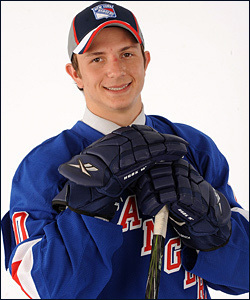 The Toronto, Ontario native was originally the Rangers second round choice, 40th overall, in the 2010 NHL Entry Draft.